Finland proposed a major new initiative to fight climate change with forestation through EU-Africa Partnership. The initiative was presented today by Minister Jari Leppä at the first Forest Academy for EU Decision Makers, organized by Finland and Sweden. “The report of the International Panel on Climate Change IPCC again reminded us of the threat posed by the warming climate to life on earth. Forests are the most effective means to remove carbon dioxide. The IPCC called for action to prevent the loss of forest and significantly increase the world’s forest area. 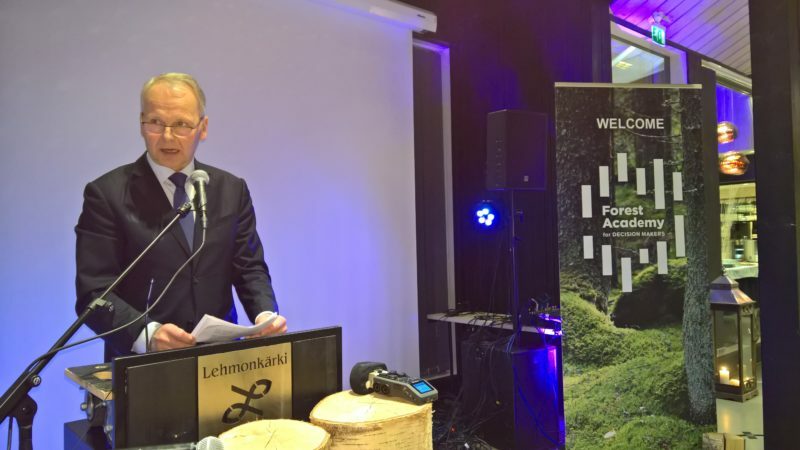 That is why Finland proposes a Forest Fund to the European Commission, as part of the EU-Africa investment programme”, states Mr. Jari Leppä, Finland’s Minister of Agriculture and Forestry. Finland’s Prime Minister, Mr. Juha Sipilä has already discussed the Finnish initiative with the President of the European Commission, Mr. Jean-Claude Juncker. Mr. Jari Leppä, Minister of Agriculture and Forestry has informed the EU Commissioner for Agriculture and Rural Development Phil Hogan and the Member States. President Juncker has proposed a new Africa–Europe Alliance for Sustainable Investment and Jobs. The President’s proposal is extremely timely and critically important and would provide a solid basis for the new fund, now proposed by Finland’s Prime Minister, Mr. Juha Sipilä. The Forest Fund, to be established by the Commission, is designed to maximise the impact on climate and rural jobs in Africa, in full cooperation with the African partners. The need and potential are huge. “Every year as much as 2 million hectares of forest is lost in Africa. One of the main reasons for this is the collection of firewood and clearing of arable land. Sustainable use of forests could, however, create employment and livelihood to the rural regions of Africa. Investments worth billions are needed in afforestation, forestry, and the management and protection of forests”, explains Minister Leppä. Major funding is necessary to accomplish the desired goals. The 60 billion euros guarantee scheme to boost private investments in Africa under the Africa–Europe Alliance will makeit possible to deliver the urgently needed results. “We do not have to go to Africa to plant forest. We can do this in Europe as well”, underlines Minister Leppä. Finland will use her approaching Presidency of the European Union in 2019 to promote sustainable forest management and afforestation. Together with Sweden, thetwo leading forestry countries in Europe stress that the fight against climate change and sustainable forest management go hand in hand. “We want to have more forests globally and to make our present forests grow even better, soaking up more and more of carbon dioxide as the central goal. That also means promoting the various possibilities of bioeconomy, substitutes for plastics and fossil fuels being an excellent example. Forests well taken care of grow considerably better than forests left completely on their own”, declare Sweden’s Minister for Rural Affairs, Sven-Erik Bucht and Minister Leppä together. Finland and Sweden wish to contribute their considerable expertise in forestry to the use of the entire EU. The first Forest Academy for EU Decision Makers, initiated by the Prime Ministers of Finland and Sweden, Mr. Juha Sipilä and Mr. Stefan Löfven, serves to partly fulfill the obligation the two countries strongly feel. The Academy is currently ongoing in Asikkala, Finland.